"I couldn't remember who I was anymore… So you step through the door not knowing what's on the other side." 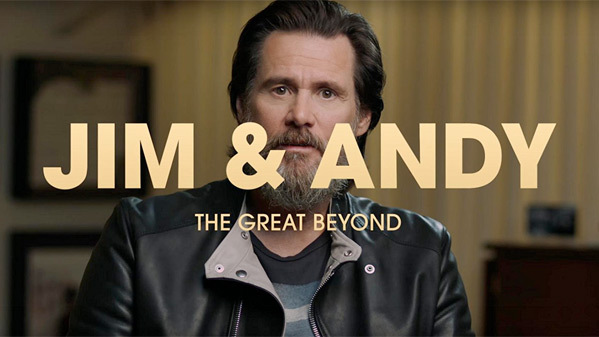 Netflix has debuted the official trailer for a superb documentary titled Jim & Andy: The Great Beyond, which is all about the performance Jim Carrey gave as comedian Andy Kaufman in the film Man on the Moon. This documentary dives deep into Carrey's mind, examining how and why everything happened back in 1999 while making the film. They filmed over 100 hours of footage, which was never seen until now, giving us a very impressive look at exactly what Carrey was like. He "became" Andy for months, responding only to the name Andy and pretending that Jim was completely gone from Earth for that time. I saw this doc at the Venice Film Festival and loved it (here's my review), because it goes beyond just being a behind-the-scenes film to become profound as a profile on truth and comedy. It's definitely worth your time. Director Chris Smith's fascinating deep dive into actor Jim Carrey’s time spent portraying famed and complicated comedian Andy Kaufman. Using approximately 100 hours of footage shot on the set of Man on the Moon documenting Carrey’s transformation into Kaufman for four months. Jim Carrey earned critical acclaim and a Golden Globe award for the performance, but many of the production’s most Kaufmanesque moments played out behind the scenes, thankfully captured on video by Andy’s former girlfriend, Lynne Margulies and former writing partner, Bob Zmuda. In Jim & Andy, Carrey looks back at the resulting footage 18 years later, reflecting on how he and Andy came up in oddly parallel universes, his experience channelling Andy and Tony and more broadly the spiritual journey of his career. Jim & Andy is directed by filmmaker Chris Smith, of the films Collapse, The Pool, The Yes Men, Home Movie, and American Movie previously. This first premiered at the Venice & Toronto Film Festivals this fall. Netflix will release the doc streaming exclusively starting November 17th. Read our review. Don't miss this one.